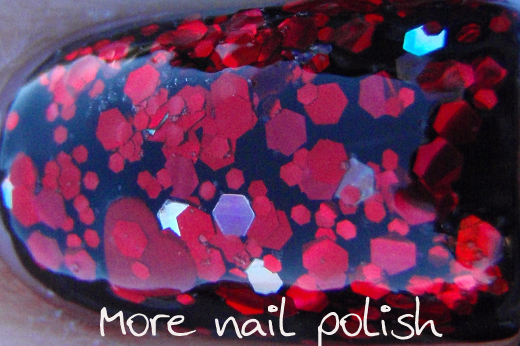 I recently received some more polishes from Glimmer by Erica. Here is the first one that I chose to wear. 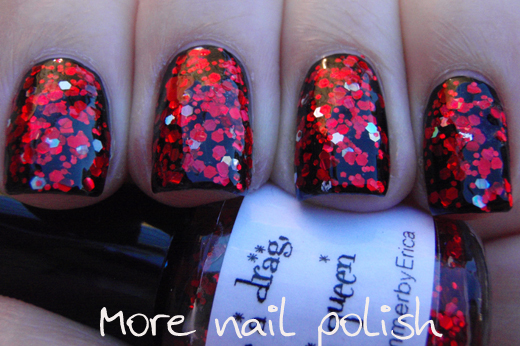 Don't be a drag, just be a queen has rich red hex glitter in two sizes, silver holo hexes and some red hearts, all in a clear base. Here I layered two coats of Don't be a drag, just be a queen over a black base. I did put on two coats of top coat to get a nice smooth finish. I can see some hidden bubbles in this macro, but I swear they weren't there in real life, plus my top coat hid them completely and I didn't feel any lumpies. All the glitters were perfect and flat, even the large hearts didn't give me any issues. The formula on this was thick but workable, but chunky glitters need a good thick formula so you can get plenty of glitter out. I Will Survive is an Australian reality TV show where the premise is to find a “triple threat” all singing, dancing, and acting musical theatre star. But the twist is that it is all blokes who have to dress up in drag and perform a la Priscilla Queen of the Desert style, and they drive through outback Australia on a silver bus performing in the small country towns. Its a great show and I have to say that all the guys really are fantastic and I think there are some real stars there! Are any other Aussies watching this show? Now, back to the polish. 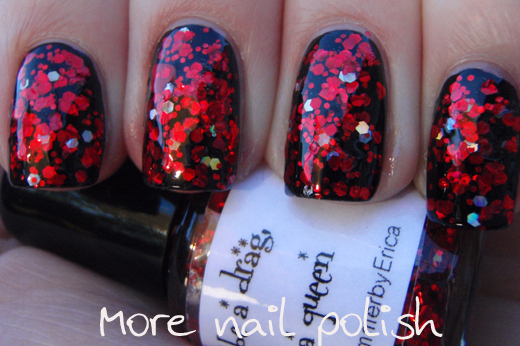 Glimmer by Erica polishes are available from her Etsy store and are $10USD for a full sized bottle. Yeah, I see what you mean. I had to go searching on my nails to see if I got any hearts. I can't decide what I love more - the polish, or the name? Anyway, I imagine this to be a great pick-me-up on those days when I don't feel 100%. Has anyone from the UK ever approached you about reviewing a glitterbomb indie polish? I'm desperate to find a seller here in the UK! I can't afford all the shipping costs and taxes but so far I'm drawing a blank on anyone local. Nothing, yet - I think the main problem is that there isn't any suspension base available in the UK, which really limits it. Although I know that Aussie supplier Beauty World will be able to ship their lacquer internationally soon, so there might be some new starts ups. Ooh I love it! 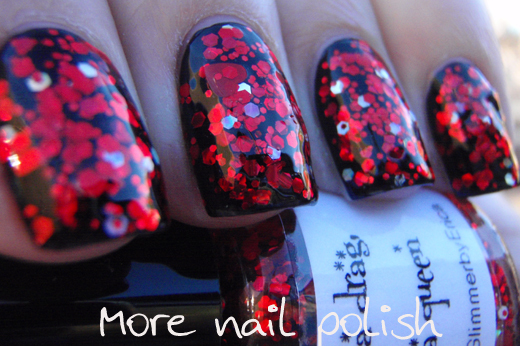 What a beautiful glitter! Etsy is fast becoming a great place to find polishes isn't it? Keep up the beautiful swatches!! OMG cathy i LOVE that show! it is great!!!! Oh my! I am in LOVE! 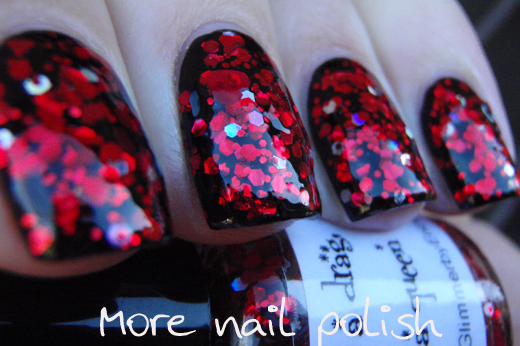 Stunning glitter and layered over black.. Amazing! Have you tried it over any other base colours?